Just in time for St. Paddy’s day celebrations, OR for a cold day and you need a hearty warming recipe, try my low-carb Guinness Stew. Paddy’s Day, St Patricks Day, Lá Fhéile Pádraig (you didn’t know I could speak Gaelic did you?!). The Irish sure know how to celebrate so what better way to get in on the fun than with a low carb take on a great Irish combo -hearty beef and creamy Guinness. The best thing about this recipe is that it tastes even better the day after you make it so you can have it all ready in advance. 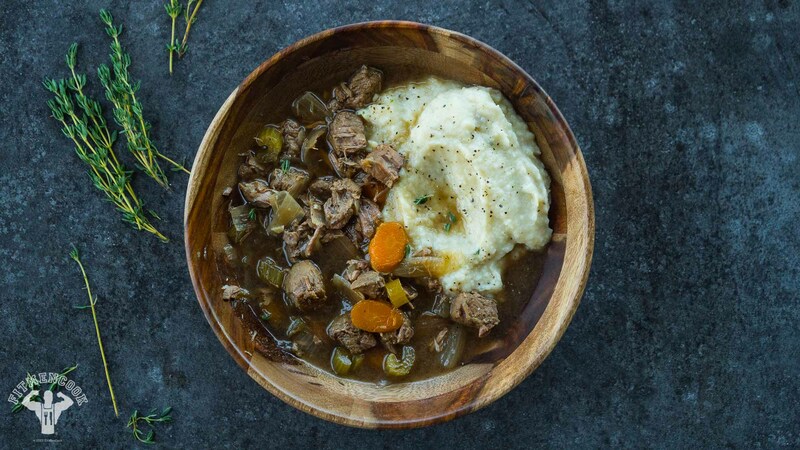 Traditional versions of the stew use much more Guinness to lock in the flavor but that also adds extra calories. To reduce the calories from beer, we’re going to saute then simmer/cook the beef cubes in a small amount of Guinness before adding it to the slow cooker. This helps lock in the beer flavor that is indicative of traditional recipes. We’re also using a lean steak source to reduce the overall fat calories as well. All this and we STILL have great flavor! I got all my ingredients from my local Kroger so these ingredients are easy to find. Oh, and save yourself some money and buy the store brands of beef stock and the fresh herbs. Set your slow cooker on the “Saute” setting on medium heat, let it get hot then add the oil. If you do not have a slow cooker with a saute setting, set a large nonstick skillet on medium-high heat and add oil. If your skillet or slow cooker is small, then only add half of the beef (and oil) and allow to sear. Note: it’s important to allow the beef to catch on the pan to get a rich caramelized, brown crust before you stir and turn it. Allow to brown on all sides then remove from the pan. Repeat for the rest of the beef. Place all of the seared beef in the slow cooker or pan, add thyme and Guinness. Simmer for 5-8 minutes to allow the flavors to infuse and meld. Put the infused beef (and juices) into the slow cooker along with the carrot, onion, celery, garlic and stock. Set to cook on low for 6-8 hours or high for 4-5 hours. 1 hour before the stew is ready (or your set cooking cycle), mix arrowroot starch with about 1 1/2 tablespoons of water and stir into the stew. While the stew is cooking prepare the cauliflower mash. Bring 2 cups of water to boil in a pot and add the cauliflower florets. Cook covered for 10-12 minutes or until completely soft through, easily pierced with a fork. Drain well allowing all the steam to escape. Add salt, pepper, garlic and grass fed butter. Blend using an immersion/stick blender until it resembles mash. ONLY if needed, add a tablespoon of milk or yogurt to help bring the cauliflower together. Serve the hearty Guinness Stew with the creamy low carb cauliflower mash.